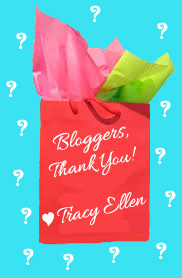 Win the Surprise Gift Bag from Indie Author, Tracy Ellen! Mark Tuesday, May 6th on your calendars because I am paying it forward that day! How am I paying it forward you ask? By throwing a Series Spotlight Blitz "SURPRISE!" Giveaway hosted by Book Enthusiast Promotions! The Giveaway will be featured on many Book Blogs on Tuesday, May 6th. This is my special way of saying a fun, heartfelt thanks to readers and bloggers everywhere for making "The Adventures of Anabel Axelrod" series a huge success! No later than Monday, May 5th, I'll be posting a link here for readers that will list the Book Blogs participating in the "Surprise!" Gift bag Giveaway. Readers can sign up at any Book Blog site listed to be picked the lucky winner of the surprise in the gift bag! The "Surprise" Giveaway runs for five days, so you'll have plenty of time to go to a Book Blog and sign up. The following week, I'll contact the winner to tell them their surprise prize and I'll post their name here, too! Psst...For those readers that haven't had a chance yet to read "The Adventures of Anabel Axelrod" series, the first book, "A Date with Fate", is being offered on all major bookseller sites as a free eBook! You're welcome to come sign up for the "Surprise" Giveaway on May 6th, too!